In early 2014, Latas will travel to Whenua Hou (Codfish Island), and other locations in New Zealand to observe the unique and highly endangered kakapo. There, she will spend approximately two weeks in the field studying, sketching and photographing , and observing conservation efforts, care, husbandry and management of the nesting season. "why do you want to draw Kakapo? Why do you love them so much?" It is not easy to answer. They are amazing birds. There are only 125 total birds alive, none in captivity. They are large, ground-dwelling, nocturnal, flightless, aromatic, lek-forming, eaters of harsh fiber, survivors of Gondwanaland. They are lovable, wise, shy, outgoing, curious, inquisitive, forgiving sprites of the forest. And they are almost extinct. 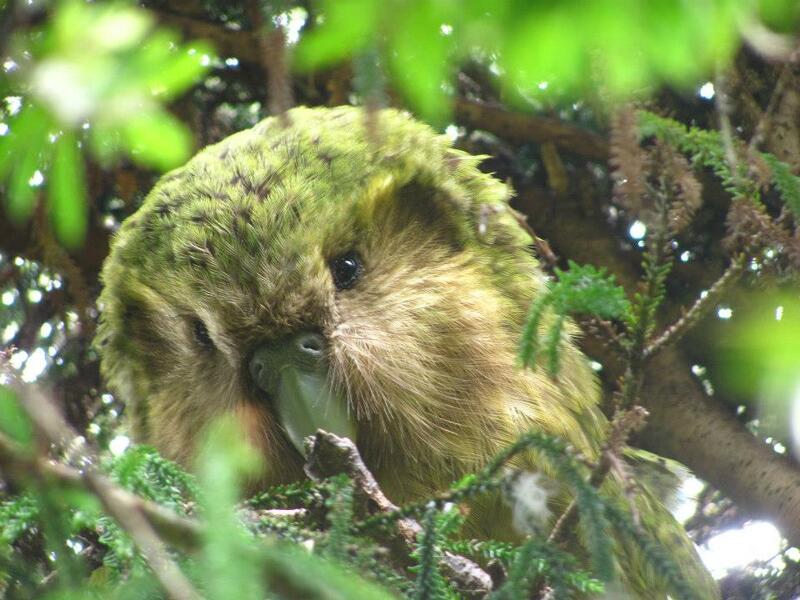 Kakapos are an interesting study in biogeography. They rode the ancient New Zealand lands to the present position, and flourished until humans came aboard. Kakapo diverged from the base of psittacine evolution around 70 million years ago, according to most studies (http://www.onezoom.org/birds.htm is a fun tree of life for all birds). So I love them for their place in the history of the world. Kakapo anatomy and physiology is almost unstudied. There are very few descriptive papers even relating to the skeleton. Radiographs, CT and MRI images have been gathered from a few individuals. There are a fair number of investigations into feeding ecology. But the truth is that for such a large, endearing parrot, very little is known. And now that they are almost gone from the Earth, it is almost too late. Certainly we will never be able to study the true ecology and social structure these big birds once enjoyed. So I love them for their mystery. As an illustrator, these birds provide a serious challenge to my skills. As most scientific illustrators will tell you, green is a difficult color to render realistically. Mottled moss-mimic green even more difficult. Try drawing a piece of moss! Then turn it into a feather with a distinctive pattern! And underneath all that green fluff is a parrot--for artistic purposes, an amorphous lump. The form has to be given an avian appearance. Then of course come the gender and age distinctions, personality markers, injuries and markings, and the invisible magic. So I love them because of the challenge. Then, they are parrots. And they are really, really parrots. As anyone with a companion parrot or anyone that has done fieldwork with psittacines will testify, Parrots are special birds. I love those feet, that beak, that smell. They are smart, easy-going and can solve problems. They belong to themselves. So I love them because they are parrots. And I love them because they are individuals. 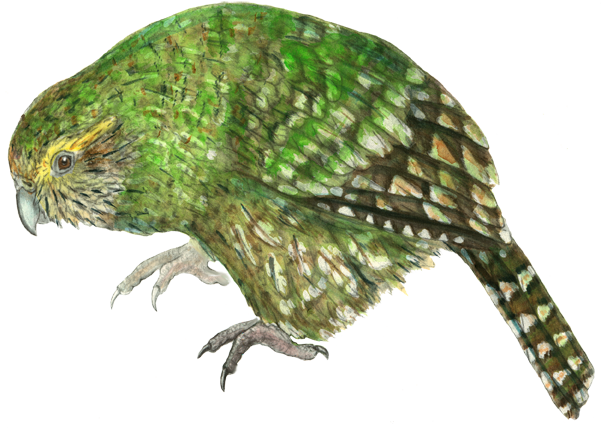 It is thought that Kakapos easy lived to 100+ years of age, and several of the kakapo are known to be 60+ years. Flossie the Kakapo, whom I had the great honor to observe, is 50+, and a very good and patient mother. I love them for being what they are. And I love them for their tolerance and forgiveness and dignity. In spite of the horrors that human beings have brought to their tribe, Kakapo are forgiving and quiet birds. The wild older birds tolerate handing, sampling, and treatments with a dignity and aplomb that many humans should emulate. They go about their business in spite of human interference. And lastly, Kakapos have a magic, a mystery, a spirit, that goes beyond science and reality. They have an endearing quality that reaches across the miles and across the globe. They are naughty, mischievous, inquisitive and FULL of life. The proof is that a "Kakapo" is a Facebook and YouTube star. I love them because they can become celebrities!